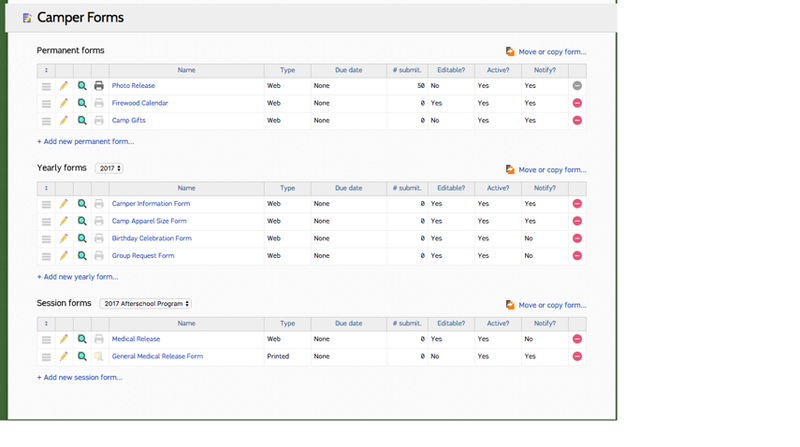 Creating forms allows you to collect information about Campers and Staff online through the Parent and Staff Dashboards. Forms are organized into Permanent, Yearly and Session scopes. Session forms are linked to specific camp sessions, and will only appear on the Parent Dashboard if their camper is enrolled, or the Staff Dashboard if the Staff member is hired, for the session the form pertains to. All three forms can be moved or copied between "scopes" (permanent, yearly, session). This includes the ability to retain existing submissions. 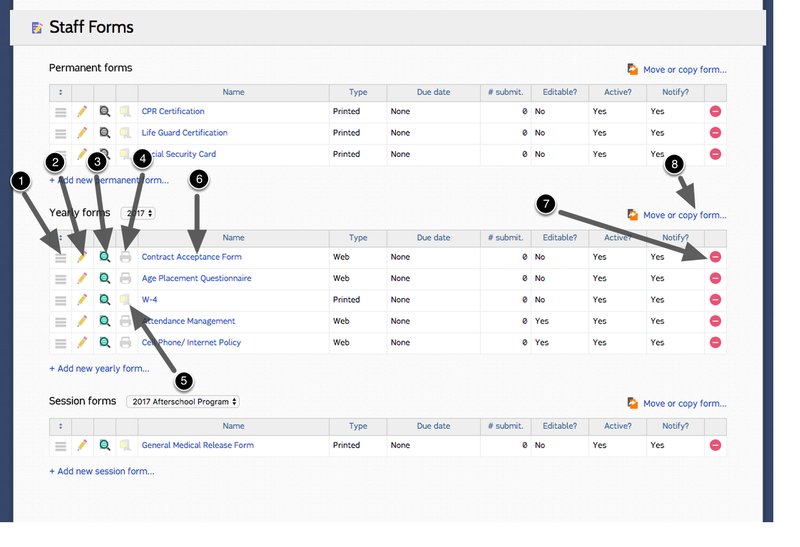 Look for the "Move or copy..." link on the forms management page to use this functionality. Camper forms can be completed through the Forms tab of the Parent Dashboard, and can also be integrated into the enrollment process. Advanced Reports criteria can be applied to forms to restrict them to be available only to specific campers. To create Camper forms, select "Camper forms" from the Camper dropdown menu on the navigation bar. 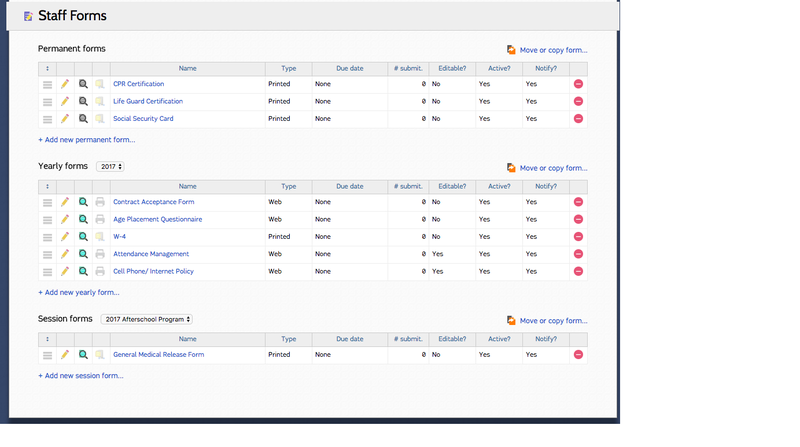 Staff forms can be completed through the Forms tab of the Staff Dashboard. Advanced Reports criteria can be applied to forms to restrict them to be available only to specific staff members. 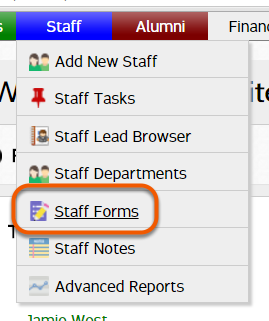 To create Staff forms, select "Staff forms" from the Staff dropdown menu on the navigation bar. Click the printer icon to print web forms. Double-click the red minus sign to delete a form. Forms cannot be deleted one they have been submitted by a camper or staff member. Click to move or copy forms to another permanent, yearly, or session form.